The CNA salary in Missouri can change depending on where in the state you are employed, along with the type of facility you are employed with. Nursing assistants in MO can be employed with home health care agencies, nursing homes, hospitals, home care services and be self employed. If you enjoy helping people and looking out for their health, you might want to think about becoming a certified nursing assistant or CNA. Under the supervision of a registered nurse, a CNA helps take care of a patient’s healthcare needs. A CNA can find work in hospitals, clinics, nursing homes, adult day care centers, assisted living facilities and at a patients own home. 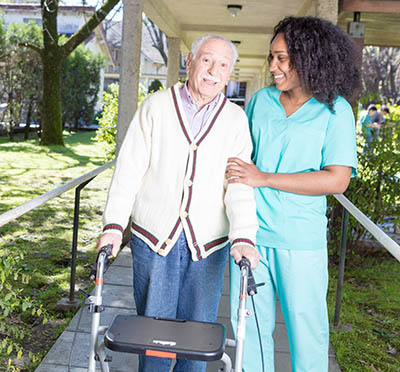 A CNA has daily contact with patients and provide for their basic quality-of-life needs and are able to gather vital information about a patient’s condition. Being a CNA allows you to take home a good salary and offers you the satisfaction of knowing that you are helping people in need. According to Indeed.com, in the United States, the average salary for a CNA is around $12.02 an hour or $23,726 a year. If you choose to become a CNA in Missouri, you are looking at an average salary of around $10.98 per hour or $489 a week. This comes to around $24,000 a year for those in the larger cities. This is a list of the annual CNA salary in Missouri for 15 of the most populated cities in the state. Nursing assistants can earn different salaries depending on the type of health care facility they work at. The highest paying jobs tend to be available in the cities, however, don’t totally close your eyes to job opportunities in rural areas either. Because of the demand, some rural facilities actually offer high salaries and good benefits to lure CNAs away from the cities. Another factor that affects the pay range of a CNA in Missouri is their level of experience. Experienced CNAs are often offered favoured by employers and will be offered higher pay rates. This is because hiring experienced CNAs save companies money in training. The good thing about employers preferring veteran CNAs is that they are also willing to pay to keep experienced CNAs. This means that, after a year or so at a health facility as an entry-level employee, your employers will be very open to hiking up your salary to keep you in their employ. Being self-employed pays the best, but if government or private hospitals in both the rural and urban areas also pay well and hire a great number of CNAs. To become a CNA, you need to have a high school diploma or a GED. While a degree in healthcare can help prepare you for a CNA career, it is not typically required. You will then need to take some form of post-secondary nursing instruction. CNA training programs are available from a variety of institutions; these include community colleges, online schools, and trade schools. After you have completed your training, depending on what state you are in, you will need to fulfill certain requirements to become certified. Usually this is a simple matter of taking and then passing a specific state’s nurse aide exam. Missouri has some of the most extensive training requirements for CNAs in the country. They require you to have 175 total hours of training, this means 75 classroom hours and 100 clinical hours. The Missouri Department of Health and Human Services designs and approves the programs that train CNAs to work in their state. The minimum age for CNA training in Missouri is 18. However, students under 18 can train if they are taking high school education coursework. After you have completed your training, you will need to take the state’s nursing assistant certification exam. This exam has both written and skills portions. Once you pass, you will receive your certification and be able to work as a CNA in Missouri. This certification is valid for 2 years. If you already have your nursing assistant certification from another state, you can apply with the Missouri Department of Health and Senior Services to be certified in Missouri.